Also, this whole thing is super weird and crazy. 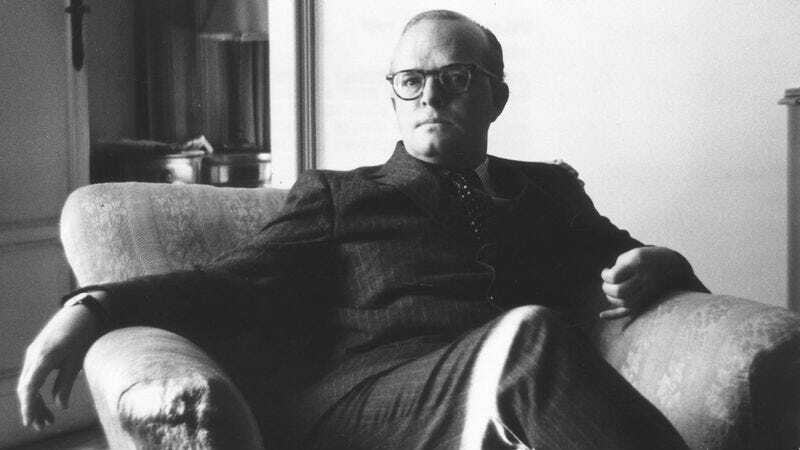 It’s certainly possible that someone who knew Capote bought the ashes, but the idea that some anonymous stranger owns the remains of a famous person and paid a substantial amount of money for them is—once again—super weird and crazy. Do you put them on display? Do you travel the world and carry them with you? Do you do some third thing that we don’t even want to think of because it’s too upsetting? This is even stranger than when a lock of John Lennon’s hair sold for $35,000 earlier this year, because at least that could be used to create a clone army—as was our theory at the time. These Capote ashes were actually a part of the guy, so even a joke about doing something funny with them seems a little crass. As for how the ashes found their way to the auction house in the first place, CNN explains that the previous owner was Joanne Carson—Capote’s best friend and the ex-wife of Johnny Carson. He left the portion of ashes to her when he died, and he had apparently given her direct orders not to let him “sit on a shelf.” Carson died last year, and so the ashes were put up for auction along with some of his other personal items, including clothing, ice skates, books, and—because it’s just this kind of story—both the shirt he was wearing on the day he died and a set of his prescription bottles. Obviously, that stuff sold for a bunch of money because people are super weird and crazy.